There is a wide range of information that needs to be created and stored within an ECEC centre. This consists of information specific to children, including medical information and incident reports, centre policies and procedures and the centres strategies and Quality Improvement Plan. This information, usually in the form of documents, will be created and updated by several centre staff over many years and needs to be retained in a central accessible place and easily located. How can staff be sure they are using the latest or correct version of a document? How do you easily produce documents within an NQF audit including demonstrating a history of updating documents? How do you maintain the security appropriate to the information contained in the document, for example sensitive child and staff information? How do you ensure the information is stored for the correct length of time as stipulated by legislation, for example until the child turns 25 in the case of Incident Reports? Ensuring you implement an easy to use solution that facilitates creating, retaining and searching for the range of documents required within your ECEC centre. We recommend the use of SharePoint within Office 365 as the basis of a document management solution as this delivers a robust cloud-based document management solution with guaranteed levels of availability, built in management tools such as version control, strong search capability and managed redundancy including data backup. A logical structure for storing the documents and a process that ensures documents are created and stored appropriately. 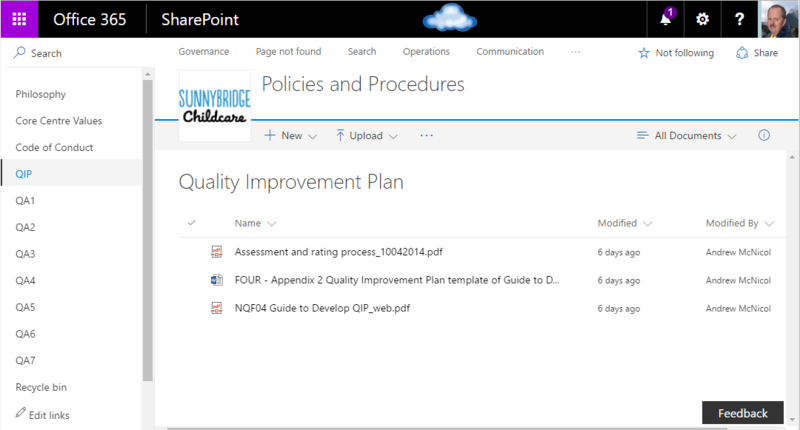 Cloudbridge have developed a Document Management Framework within Microsoft Office 365 specifically for the ECEC sector based on the NQS and legislative requirements. Using this framework staff will know where to store and locate documents and will know they are using the latest version of this document. Staff trained in using the solution including how to correctly store and search for documents. This requires a brief initial hands on training session and ongoing familiarisation with the document management solution through frequent use. If you are interested in discussing our Document Management Framework based on SharePoint with Microsoft Office 365 within your centre/s please contact us at enquiry@thecloudbridgegroup.com.au or on 0409 268 648. Further details on our Childcare Document Storage Framework can be found at https://thecloudbridgegroup.com.au/document-management/.